Most of our New Years' Resolutions are based on our body...losing weight, eating less sugar, etc. But who wants to deal with the usual? I certainly don't! The best resolution to keep right now is to treat yourself well. As in, sit down and relax! 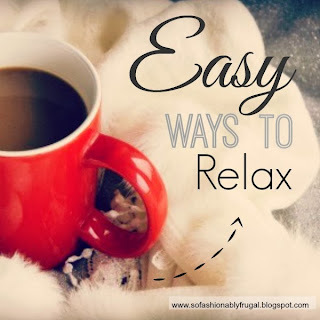 The holidays can make some of us crazy so it's time to rewind and mentally replenish. I made a list this week to help you guys out. These are some of my favorite ways to relax when I get super-stressed. No matter what, one of these steps always helps to calm me down. The secret really is to make time for yourself. Something that's really hard to do when you're running all over the place. 1) Change to PJ Pants - We women do a lot for fashion. Including wear really uncomfortable stuff! So as soon as you get home reach for your PJ pants. It's oddly fulfilling when you do this. 2) Drink Something Soothing - We all have different tastes when it comes to this. So whether coffee, tea, or hot cocoa soothes your soul...it's a good route to go when you're stressed. 3) Give Yourself A Manicure - Some people get really frustrated with this...and if you're one of them skip this idea! I personally find painting my nails to be really stress relieving...so it's on here. 4) Light A Scented Candle - Candles are great for keeping you relaxed. Especially if you buy an aromatherapy candle! 5) Eat Your Comfort Food - We all have one. For me it's Waffles. Make yourself some of your favorite comfort food or order it to go! 6) Go On A Walk - I've read multiple times that walking outside can really calm you down. It's true! 7) Watch The Snow Fall - Sitting by the window watching snow fall is strangely calming. So if it snows by you...try it some time! 8) Dim The Lights - Doing this can easily change the mood of a room and instantly relax you. 10) Take A Bubble Bath - The warmth of the bath and bubbles can smooth over even the worst of days. 11) Put On Fuzzy Socks - Relax your feet with a pair of soft fuzzy socks at the end of the day. Especially if you've been in heels! 12) Dance - Whether in public or alone, dancing can help you exert stress. 13) Watch Your Favorite Movie - If it's your favorite it's definitely going to make you happy! So cuddle up with a blanket and get watching! Spending time for yourself is the key to being calm. 14) Go Shopping - Rewarding yourself with something small can instantly make you feel a lot better. Just don't overdo it! 15) Sing - This is another activity that easily exerts stress. And you can do it anywhere...even in your car! 16) Write - Whether it's a story or just a little blurb in your journal...writing about your problems is a great way to get out your stress. 17) Try Yoga - At the end of a yoga session you usually want to zonk on the mat. There's a reason for that! You relax both your mind and body. 18) Sit In A Quiet Room - Sometimes all you need to relax is to hear absolutely nothing...and just sit and enjoy the peace and quiet around you. 19) Listen To Music - Slower music, especially those without vocals help to relax your mind, and through this your body. 20) Lay On The Beach - If you live near a beach then I'm super jealous...you should definitely take advantage of it! Listening to the ocean waves is extremely calming...and no matter what time of the day you'll always hear it.